I’ve just stumbled across the Raspberry Pi (RasPi) and have spent the past 3 hours contently reading about it and the Gertboard. In a nutshell, RasPi is a credit card sized computer with USB, HDMI, composite and analogue audio I/O ports – all powered by a 600MHz Broadcom ARM processor and 128MB RAM – selling for $25. There’s a $35 “B” model which, as I understand it, has 256MB RAM and an Ethernet port. An SD card reader provides permanent storage for the device. 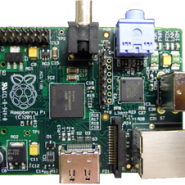 The RasPi beta boards have been shown to successfully run Linux and are set to be the core of a host of home-brew devices performing a variety of tasks. The boards can compile and run high level programming languages and would be perfect to teach programming to school kids and individuals alike. However, the thing that interested me most was Gertboard. This is a programmable expansion board for the RasPi. It was created by Broadcom Engineer Gert van Loo and has been designed to teach both electronics and low level programming. In another nutshell, it allows the programming and control of motors, relays, LEDs, etc. I have personally dabbled with electronics (with little success) and this is something that really interests me. I half wish I did electronics as a degree rather than spending 3 years learning very little of real value on a Computer Science course. I dabbled with low level programming in the form of Intel 8086 compatible assembly language whilst at University and I quite enjoyed this also. I rarely jump on anything shiny and new, eagerly anticipating its release; however the RasPi and Gertboard have gotten my attention and I will be sure to pick some up when they’re released.